Out of all the drinks that people consume every day, water is the most basic and; as some would say, most boring drink there is. That does not mean that everything about water needs to be boring. More and more people are beginning to use custom drink bottles to somewhat spice up the very boring beverage. For those who are always on-the-go and are very conscious about their health and well-being, there are some items they can never leave the home without. One of the essential items for many fitness buffs and hard workers are water bottles. It allows them to ensure that the water they are drinking is clean. Plus, it allows them to measure their daily water intake as well. Many people prefer bottles when on-the-go simply because it is portable and easy to keep. The problem with bottled water, though, is that people use it so much to the point that it is beginning to harm the environment. Plastic bottles take a long time to degrade and people often forget about how hazardous this product is to the environment. People should do their best to help save the environment in their own part and one of the ways to do that is by lessening the use of plastic bottles. To make this task easier, it is best to keep custom drink bottles so owners can have a water container to call their own and they could also refill these containers to their heart’s content. There is more to these items than meets the eye though as they are more than just another method to save the environment. More and more businesses are starting to use new and unconventional ways when promoting their establishments to countless possible customers. Custom drink bottles are becoming the go-to advertisement method for many business owners and this is for good reason. 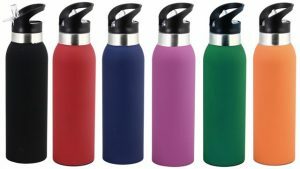 It allows a company to make lasting impressions on customers as they will keep the water bottle for a long time and aside from that, they would give water containers that can be used over and over again. By using these custom-made products, business owners are benefiting from the customers they get through the advertisement and they are also saving the environment in their own way by giving people bottles to use for a lifetime. When being bought by the bulk, these custom made products are pretty cheap so business owners should consider trying it out for themselves.